“Good music, like sublime scriptural poetry, is inexpressively sweet and nourishing to the soul and tastes strong of heaven”. On September 15-16, 2007 a significant community event took place in Singers Glen, the rural Virginia hamlet where I spent most of my growing up years and still live today. This event is the Singers Glen Music and Heritage Festival which has been held in Singers Glen roughly every five years since 1978. The highlight of the festival is the performance of the folk opera "Singers Glen", a theatrical performance written by Alice Parker, a well known writer, musical arranger and graduate of the Julliard School of Music in New York City. 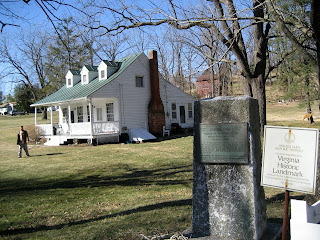 This drama celebrates the life of Joseph Funk during the early and middle years of the nineteenth century when he compiled and first published the shaped note hymnal Genuine Church Music, better known in this area as the "Harmonia Sacra", and conducted singing schools up and down the Shenandoah Valley. Christine and I were actors in this drama during the early years of its performance and it is from this experience that we deepened our familiarity with the "Harmonia Sacra" and share a passion for it today. Mr. Funk was a well educated, deeply spiritual, and talented musician who left not only a unique collection of songs which are challenging and fun to sing, but also an enduring tradition of shaped note singing which is celebrated in Harmonia Sacra sings regularly held in churches and community centers in this area. Originally known as Mountain Valley, Singers Glen gets its name from the rich legacy left behind by Joseph Funk. The Harmonia Sacra is but one of several shaped note hymnals which were used along with the promotion of singing schools on the advancing frontier throughout the South during the early nineteenth century. Others are Benjamen Franklen White’s Sacred Harp and Ananias Davisson’s Kentucky Harmony. 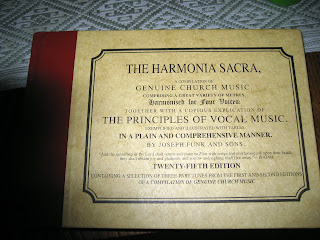 Several characteristics make the Harmonia Sacra stand out as unique when compared to other hymnals. In most of the four part music of European origin with which most of us are familiar, the soprano voices carry the main melody. In many songs in the Harmonia Sacra these parts are reversed so that the tenor voices carry the melody. This gives the music a flavor uniquely peculiar to the Harmonia Sacra. Second there are the robust rhythms which not only give the music life and vigor but speak eloquently to the strength and stamina that those pioneers of the early nineteenth century had to have in order to survive the rigors of life on the early American frontier. As one sings these songs he cannot help but notice the recurrent themes which allude to the joys of heaven and the release from the pain and sufferings of earthly life. Virtually all families were touched repeatedly by death brought on by illness and other dangers of life on the frontier. In a life devoid of most of the comforts and securities which most of us take for granted in modern times, one can more easily understand our ancestors’ humble reliance on the “mercies of God” and their looking forward to a better afterlife. And finally there is the beautiful poetry, fascinating forms of archaic expression, and the occasionally stark phrases that jump out and grab your attention. Where else but in the Harmonia Sacra will you find titles like "Divine Adoration" or "Sweet Affliction" and phrases like “Strengthened thus I still press onward, singing as I wade to Heaven” or “Oh this dreadful heart of sin, it may deceive me still, and as I strive for joys above, may plunge me down to Hell!”? One of the more endearing Harmonia Sacra sings takes place on the first Sunday in August at the old Mauck Meeting House Church in the village of Hamburg near Luray, Virginia. The setting is a rustic and beautifully restored old log church building which has stood since the late 1700s-early 1800s. This is an all day event complete with several hours of singing in the morning, a potluck picnic (“dinner on the grounds” as the old folks would say) under the majestic old maple trees in the church yard, and several more hours of singing in the afternoon. As folks enter the building, furnished with narrow and crude wooden benches and an ancient cast iron pot bellied stove in the center of the room, the moderator of the event greets them with a hearty handshake and asks some of them if they are able or willing to lead a few songs. If they say "Yes" they are likely to be called upon to lead several songs of their own choosing sometime during the service. The singing begins informally with the moderator leading the fist several songs and announcing a succession of several following song leaders, allowing them a little time to prepare to lead their songs. 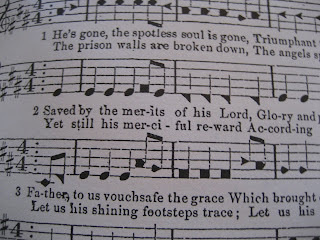 Each one typically leads about two songs, announcing the page numbers and song titles in both the old edition (the long book) and the “Legacy” edition (the new book). All singing is done “acapella” with no instrumental accompaniment. Occasionally breaks are taken to take a roll call of distant states where attendees may have traveled from to attend the singing, or they may announce the ongoing schedule of upcoming sings. This is the general pattern followed at most Harmonia Sacra sings. The mid day picnic is an experience in itself, featuring the best of Mennonite home cooking and lots of joyful visiting. When one considers all that makes the Harmonia Sacra unique, the robust rhythmic harmonies, the poignant imageries and sentiments, and the colorful poetry, and joins in a gathering of several hundred souls of the most experienced of four part harmony acapella singers, they can revel in the best of congregational singing and appreciate what makes the periodic Harmonia Sacra singings such an enduring tradition and the history of Singers Glen a legacy of such treasure. The house is definitely taking shape. They shingled the roof this past week and hung most of the drywall. From what builders tell me that means the house project is half way to completion. There still seems to be an awful lot to do yet. Just cleaning up debris still remaining in the yard (including what the builders are now adding to the piles) and relocating the fences will be a monumental task in itself. Despite the mess, we feel good about how the house is turning out. We did most of the architectural design ourselves after being advised by one prospective builder to hire an architectural firm to draw up plans. To do so would have added about 5% to the cost of the house, something we immediately balked at. We got out a number 2 lead pencil, some graph paper, and a foot long ruler and went to work. We figured that if one has a skill worth $10,000 he had better use it. What we came up with is basically a modified cape cod style with a one story 16' section on the south end, a one and a half story 36' mid section with an eight foot deep porch across the front and a two car sized garage-shop with a 5/12 pitch roof (same as on the south end) and one roll up door for a car entry. A walk in door was spaced between the roll up and the house so that if someone decides later that they need the second roll up, all they will need to do is to knock out a few studs. The entire east side is one open great room including a parlor with vaulted ceiling on the south east corner, family room in the middle, and dining room-kitchen next to the garage. The upstairs portion of the Cape Cod section is one long 16' x 36' room which will be used initially as a guest bedroom with ample attic storage along the sides. This room is big enough to allow a bathroom and two medium sized bedrooms to be inserted in the future if needed. An eight foot wide bay window graces the east side of the parlor. Master bedroom, master bath, steps to basement and upstairs, sewing-work room (can be used as a bedroom if needed), and laundry-half bath room occupies the entire west side. The basement area has been rearranged and plumbed to accommodate a kitchen-dining room, bathroom, living room, and bedroom and will be usable as an apartment (Building codes do not allow us to call it this.) The painting, flooring, and kitchen will be completed as we have time and money. (Christine has already purchased used kitchen cabinets.) In the near future we will likely use this space to house exchange student-farm trainees or possibly renters who would be able (or willing) to help with farm work or do farm sitting as part of their rental arrangements. If our intentions to avoid moving to assisted living and/or nursing home when Christine and I become too decrepit to care for our selves carries through, this basement may become our dotty quarters. This will depend upon our success to attract family (our own or someone elses) to take over the rest of the house and be able to meet our needs. Aside from mentioning on a previous post that much of my planting got into the ground as much as a month late, the growing season proceeded as normal, extreme heat and drought through July and the first half of August and monsoon like rains in the last half of August. The tomatoes took off with a bang in late June-early July and are mostly dead from blights by the end of August. The cucumbers suffered a similar fate. The melons mostly ripened within a few days and, because I didn't have the walk in refrigeration up and running yet, I lost about half of the crop because they over ripened before I could get them marketed. I fought deer, cucumber beetles, flea beetles, and harlequin bugs with varying levels of success and failure. I am experimenting with more varieties of edamame soybeans and am having a little better success marketing them this year. Three varieties of heirloom pole snap beans and one heirloom lima bean with extra long pods are maturing now and doing well. Red raspberries are coming in now and if the monsoon rains hold off and we get no hurricanes, we might have a good crop. Last week I got the Shingles. The shingles on the house are pretty. The Shingles on my bottom are not pretty! When somebody once told me that Shingles hurt, they wudden kiddin! It began with extreme sensitivity on most of my right thigh which felt like a heat rash as I was working. I would take down my pants expecting to see a rash and see only normal healthy skin. After a few days an angry red rash of blisters fin ally appeared on the inside of the thigh dangerously close to the privates (definitely not a nice place to have shingles). I thought initially that I would ride this one out but more rashes erupted and intensified over the following days and by Friday my leg felt like it was scalded and every five minutes or so I would get shooting stings that felt like I was being stung by hornets. Despite the fact that Friday was a "get stuff picked for market day" I realized that this thing was getting too hot and limped off to Emergicare (my regular doctor was out) and killed most of the day fighting heavy traffic and stewing in waiting rooms. So much for how the American health care system works (or not works)! I got home around 5:30 and helped Christine pick raspberries and beans for a couple of more hours. The medicine seems to be working as the rashes have stopped spreading but I still feel yucky. It is difficult to tell how much of the yucky is being caused by the Shingles and how much is being caused by the medicine. Now you know why I wanted to avoid going to a doctor in the first place.